Sitting in our small room, my sister and I listened to the echoes from the television mixed with the slow drone of the Xbox. Playing our favorite Batman themed video game had become a habit for us. 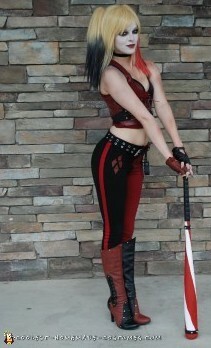 As she watched me navigate The Caped Crusader over a common thug and sucker punch Harley Quinn, the words fell from her mouth, “Do you think you could make me a Harley Quinn Halloween costume”? Sure, I’d made costumes before; but as I looked up and down her intricate stitches, fabrics, and tattoos I felt extremely overwhelmed. Not to mention crafting the iconic four foot tall mallet. Without skipping a beat I agreed to make the costume and thus began my four month journey of transforming my sister into a Harley Quinn Halloween costume. I spent countless hours in our garage covered with sawdust and sweat trying to perfect every detail. When she tried the finished product on for the first time, it made every effort worthwhile. 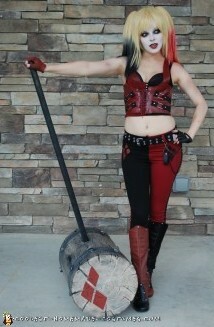 It was a screen accurate, Harley Quinn Halloween costume. We decided to do a photo shoot in our local park. So, we setup our equipment in a run down amphitheater behind a playground. An hour into our session a young toddler ran around the corner. Stopping in her tracks, she stared at us in awe with as her mother followed in her tracks. We spent the next thirty minutes discussing our favorite things about comic books with this little girl. We talked about who her favorite comic book heroines were and why they made her feel strong. By the time she and her mother left, I decided that if my creation could bring that little girl joy, then it was all worth it.